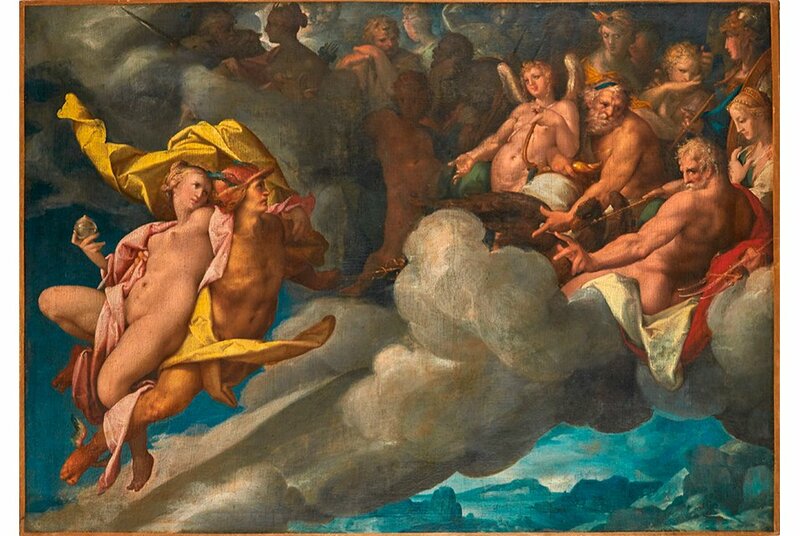 The painting “Mercury Carries Psyche to Mount Olympus” by Bartholomäus Spranger was rediscovered in a private collection. Following a just and fair solution between the private collectors and the heirs of the former owner Prof. Dr. Curt Glaser, the artwork will be auctioned at Christie’s in London in December. The painting “Mercury Carriers Psyche to Mount Olympus” by Bartholomäus Spranger (1546-1611), a court painter to the German Kaiser, which for a long time was believed lost, has been rediscovered in a private collection by the art historian and internationally renowned Spranger expert Sally Metzler. It is a landmark painting by the great mannerist artist, which has previously only been known to scholars by virtue of an old black and white photograph. Spranger painted it around 1576 during the hiatus between the arrival of Rudolf II in Vienna and the death of Emperor Maximilian. Spranger presented the painting to Rudolf II where it is recorded in the 1621 inventory of his famous Kunstkammer. It is one of the most significant paintings by the artist still remaining in private hands and certainly the most significant work by him to appear on the market in recent memory. After the current owners and the heirs of the former owner Prof. Dr. Curt Glaser agreed on a fair and just solution following the principles of the 1998 Washington Conference, the artwork will be auctioned at the Christie’s auction house on December 7, 2017 in London. Professor Glaser, a medical doctor, famous art historian, art critic, author of many important texts and books on art and art history, as well as a notable art collector, worked for Berlin museums since 1909. He had achieved great distinction while working for the Kupferstichkabinett [Gallery of Prints] before he became director of the State Art Library in Berlin in 1924. With the Nazis’ rise to power, he was persecuted because of his Jewish origin. Prior to his forced retirement in September 1933, the Nazis suspended Glaser as an unwanted and persecuted Jewish museum director from his position as director of the State Art Library already before the enactment of the ‘Law for the Restoration of the Professional Civil Service’ [Nazi law forbidding Jews from holding German civil servant positions]. After the current owners learned of the Nazi-Era History of the painting they immediately contacted the representatives of the heirs of Prof. Dr. Curt Glaser. In a process guided by expertise, respect and fairness the parties amicably settled on a fair and just solution following the principles of the 1998 Washington Conference. Pursuant to the 1999 “Joint Declaration of the German Federal Government, the Federal States and the National Association of Local Authorities on the tracing and the return of Naziconfiscated art, especially Jewish property”, these principles are only binding upon public authorities. However, the owners of the painting nevertheless decided to acknowledge the principles of the Washington Conference as private persons and to act in accordance with them. The agreement follows other fair and just solutions which the heirs of Prof. Dr. Glaser have found with the Niedersächsisches Landesmuseum Hannover, the Rijksmuseum Amsterdam, the Prussian Cultural Heritage Foundation Berlin, the Bayerischen Staatsgemäldesammlungen (Bavarian State Painting Collections), the Germanische Nationalmuseum, the Museum Ludwig Cologne, the Kunsthalle Hamburg, and other private collectors. El Greco’s Saint Francis and Brother Leo in Meditation will be offered from Property from the Collection of Stanford Z. Rothschild, Jr. Stanford Z (estimate: £5,000,000-7,000,000). Rothschild, Jr. was an investor, philanthropist and collector who helped champion civic leadership in his Maryland community. Enthralled with artists and the creative process, Stan assembled a striking collection of paintings, sculpture, and works on paper by artists whose work was both intellectually rigorous and historically provocative. He was especially drawn to El Greco, Claude Monet, Robert Delaunay, Georgia O’Keeffe, and Russian artists of the twentieth century. Certain works in the collection are being sold by the Rothschild Art Foundation, a charitable organization founded by Stanford Z. Rothschild, Jr. Overall, the collection includes 51 works and is expected to exceed $30 million. El Greco’s Saint Francis and Brother Leo in Meditation is one of the artist’s greatest and most celebrated compositions, known in several versions and copies. With its dazzling and spontaneous brushwork and richly-worked paint surface, the present canvas is among the finest and best preserved examples of the subject, a mature work by this seminal Spanish painter of a sort rarely found in today’s market. To view Christie’s video with Art historian Jacky Klein discussing the devotional power of this 16th-century masterpiece by El Greco, please click here. Further leading highlights offered in the sale include a portrait of Petronella Buys (1610-1670) by Rembrandt Harmensz. van Rijn (Leiden 1606-1669 Amsterdam) from the Collection of The Late Commandant Paul Louis Weiller (estimate: £1.5-2.5 million). Dated 1635, this painting was executed at a time when Rembrandt was flourishing, having established himself as a remarkable portraitist, able to capture likeness with greater vigour and more psychological depth than his rivals. The pendant to this picture, a portrait of her husband Philips Lucasz, hangs in the National Gallery, London. The sale will be on view at Christie’s London from 2 to 7 December 2017.